As you have seen from the Instant Data Science lesson, programming is a powerful tool for answering questions about data. It allows us to collect, clean up and format our data and then perform calculations on that data. Much of our digital information is in the form of text -- song lyrics and emails, for example. To clean up and format that text with Python, we need to become familiar with our first type of data, the string. A lot of information in the world is in the form of text. 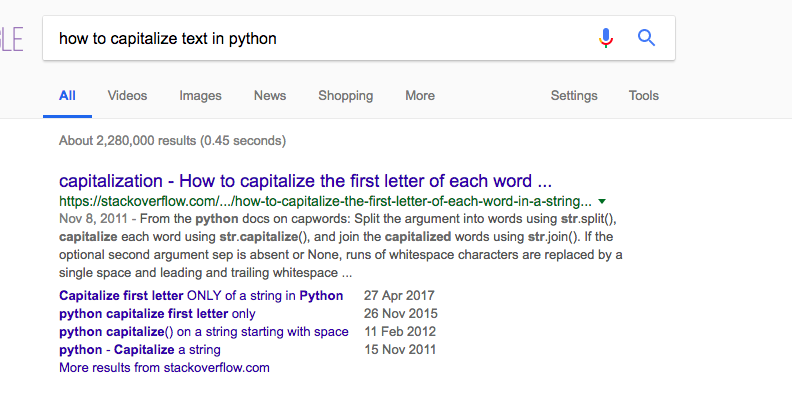 If we want to capture this information and operate on it, we should become familiar with an entire datatype in Python dedicated to it: the string. When programmers say "string", what they mean is text. When programmers say datatype, they just mean type of data. We can think of 'Homer Simpson' as an instance of the string datatype. Here is another datatype in Python, a number. We can discover the type of a piece of data by calling, or executing, the type method. By calling or executing a method, we mean running the method so that it executes the code within it. We'll learn more about these soon enough! We need to pay attention to what type of data we are working with because they operate differently. For example, to initialize a string we cannot simply type letters. Instead, we need to be very explicit with Python and tell Python it is about to see some text. We do this by surrounding our text with quotes. If we don't do that, or end our quotation marks too early, Python will throw us an error. If we want, we can also use double quotes. Note: double quotes and single quotes can be used interchangeably in Python; however, it is important that we stay consistent. Python is picky like this for a reason. Once it knows we are working with a string, it gives us specific functionality for operating on strings. We call this functionality a function, or a method. For example here is a method that works with a string (text), but does not work with a number. As you can see, by following the format of data-dot-method name-parentheses we can begin to operate on our data. You may be starting to worry about there being too many methods to keep track of. Let's ask Python for help with finding more information about what we can do with strings. The help() word with Python comes out of the box with the language and is like an old school Alexa. Just like an Alexa, it often doesn't understand us. Let's follow its stern directions, and see what happens when we type in help(str). |  Return a nice string representation of the object. |  If the argument is a string, the return value is the same object. |      Return a formatted version of S as described by format_spec. |      Use of negative indices is not supported. Note: In order to exit out of help() in your terminal, you can press the letter q. Our next step is to use our formula of datatype-dot-method name-parentheses, and see what happens next. Excellent. Just like we thought. That's really it for this lesson on strings, and it's easy to feel a little unsatisfied with just a few methods on the datatype. What's more important with programming is mechanisms of discovery and experimentation beyond just memorizing a list of features. In this lesson, we already saw a few of them. Guess: We just tried something and looked to the error message for clues as to what to do next. Here is one more method of discovery: just ask Google. For example, look what happens when we ask Google about capitalization. A great link with a detailed answer. Then we try this new method out ourselves, to see if this user on StackOverFlow is right (they normally are). Feel free to look at other common string operations here. In this lesson, we learned about our first datatype in Python: the string. A string is just text. We indicate to Python that we are writing a string by surrounding our content with quotation marks. Once we do this, we can operate on this string by calling methods like upper or endswith. We identified a general pattern for calling methods on datatypes: 'instance of a datatype-dot-method name-parentheses'. The second thing we learned was different mechanisms for learning about methods. We saw the importance of guessing and experimentation, and how doing so can give us error messages, which provide clues. We also saw how to ask questions about a datatype by calling 'help' followed by the datatype name like help(str). Finally, we saw we can ask Google. This mechanism of exploration is a skill we'll build up over time and this course will provide guidance and practice on along the way.